Decks are something that can easily be neglected in a homeowner’s busy life. If you’re outdoors much, you may not notice the grime. Or you may think it’s not worth the time, effort and money to clean it. But that’s not true at all. Cleaning your wood deck should be part of its maintenance. It’s more than just a makeover. Keeping it clean (and sealed) also keeps the wood from rotting, warping, splintering and buckling. It will save time and money on ER bills by keeping you from tripping on a loose board or slipping on slimy mold. Plus, it will prolong the life of your deck so you’re not out hundreds or thousands to replace it. Wood decks should be resealed every 2-3 years with a quality water or oil-based stain to prevent damage from the elements. But for the stain to work effectively, you must give the wood a thorough cleaning. The best method to do that? A pressure washer, of course! Check out our top-rated electric and gas power washers. Never touch the pressure washer spray. Don’t point it at kids or pets either. Plants can also be damaged, so use caution if using near flower beds and other landscaping. Wear protective gear. No shorts and flip flops. 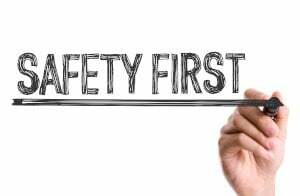 Think safety goggles, work gloves, enclosed shoes (preferably steel-toed boots), ear protection (especially with gas power washers), and pants. No ladders! Pressure washers can produce a serious kickback force, which can lead to a nasty fall. Opt for extension wands to reach high areas instead. Or call a professional cleaner. Remove all objects from the deck, including furniture, grills, toys, plants, etc, especially if they’re fragile. Sweep off any loose dirt and debris such as leaves and sticks. You can see set-in dirt much easier so you can concentrate on those areas while washing. Cover exterior lights, vents, and close your windows. Cover nearby plants and shrubs with a tarp to prevent damage from the soap. Depending on how old or weathered your deck is, look for any protruding nails. They can be tripping hazards, can injure your feet and exacerbate wood warping. Now’s the perfect time to reset them. Buy a drift pin (~ $5 – $20) from a hardware store. It’s a cylinder shaped blunt tool that lets you hammer down nails without making dents in the wood. You just set the pin over the nail and hit it with a hammer. Voila! Wait a minute – isn’t that the pressure washer’s job? Well, yes and no. It depends on how dirty the deck is. If there’s no mildew, tree sap or other embedded grime, you can probably skip this step. If your deck is grimy, time to scrub. Add deck cleaner to the pressure washer soap dispenser. Make sure you’re using a cleaner that’s safe for your wood. Change your pressure washer tip to a soaping nozzle or setting. Turn on the machine and spray the cleaner all over the deck. Let it sit for a few minutes to break up the dirt, but don’t let it dry. Use a stiff synthetic long-handled scrub brush to loosen the grime, paying special attention to corners and other hard to reach areas. Smaller brushes may be necessary for tight spaces. Switch to a wide-angle (40 – 60 degree) nozzle. Anything stronger will damage the wood. Start spraying about 2 feet from the deck surface. Move closer as needed, but no more than 6 inches away from the surface. Start with a sweeping motion at the side of the deck closest to the house and sweep outward. Overlap each spray stroke to conceal the sweep marks. Move along the length of each board (with the grain). This will do a better job of removing all cleaner residue so it won’t deteriorate the wood. Maintain the same distance from nozzle to the deck surface for consistent results. For corners, work from the corner outward to avoid pushing grime into them. Use a L shaped sweep – a long stroke into the corner, then a short stroke out with the grain. Let the wood dry for 24 – 48 hours. If you decide to reseal the deck, you should sand it first with 60 to 80 grit sandpaper or an orbital sander. Sweep away all wood dust, then follow the manufacturer’s directions for whichever stain you choose. That’s it – repeat this process every couple years or so for many years’ worth of outdoor enjoyment!